With expanded social sourcing capabilities and a revamped user interface, Oracle HCM Cloud 8 further strengthens Oracle's premier HCM platform. Oracle HCM Cloud is Oracle's premier cloud-based human capital management (HCM) offering. 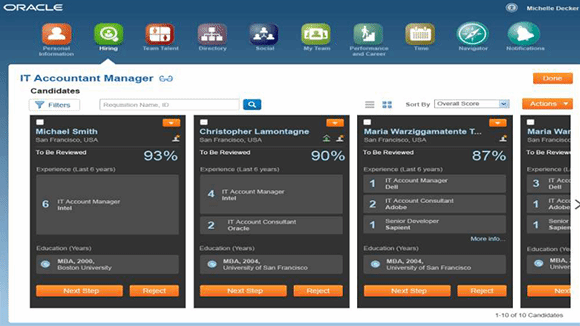 The platform combines Fusion core HR and Taleo talent management modules to provide a complete HCM suite in the cloud. According to the vendor, the system can effectively support large, global deployments. 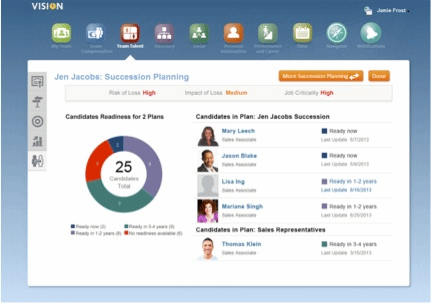 In release 8, Oracle HCM Cloud debuted more than 200 new features to further strengthen the platform, most notably in the areas of social sourcing, time and attendance, workforce modeling, performance management and succession planning. Payroll gained another country with the addition of support for Canada, and mobile capabilities were expanded to handle additional processes and provide more analytics. After testing the new HCM Cloud app for the iPad, Holger Mueller, vice president and principal analyst at Constellation Research, wrote in a blog post, "it's highly functional, easy to use and built in such a way that it is highly likely to make an everyday user [like a manager] happy using it." A new user interface was also unveiled as part of the release. Several attendees at the vendor's inaugural HCM World event, held in Las Vegas in February, received the makeover warmly. R "Ray" Wang, Constellation founder and principal analyst, weighed in on the platform's new look on Twitter. Even though he has only used Oracle HCM Cloud's mobile app for a few weeks, David Muller, vice president of talent acquisition at Stamford, Conn.-based academic publisher Cengage Learning, said he is impressed thus far. Muller explained that he primarily handles candidate referral escalations rather than dealing with day-to-day requisitions for open positions. For him, this is where the mobile app has proved valuable. "I travel quite a bit, and now that I have access to this application on the iPad, I can handle the executive referral issues that come up from an airport or a hotel," he said. "It has added efficiencies to the most challenging and time-consuming escalation issues I get. In terms of quick access [and] routing, it has far exceeded my expectations." Muller added that while his team is mostly tethered to laptop or desktop computers today, he hopes it can become more mobile in the future. According to the vendor, Oracle HCM Cloud currently has more than 100 live and 300 licensed customers. Recent customer announcements include investment management company Blackrock, Hitachi Consulting and OpenLink Software. Base pricing for Oracle HCM Cloud starts at a monthly rate of $9.50 per user. However, cost varies significantly based on specific implementation requirements and scenarios. Interested parties can refer to Oracle's HR technology pricing sheet for more information.